I like projects that use 8-pin chips. They always look so neat. To the *plxing; you lose the brightness going this route. Compared to the current route? Not necessarily true, when charlie-plexing you can push higher currents through the leds to help make up for the difference in time spent off. Almost all LED’s have an extra rating called pulse-current which usually specifies the duty cycle as well. Besides pushing higher currents, the trade offs includes excluding the resistors (reducing parts count), increased wiring complexity and increased programming complexity. To figure it out in the shortest amount of time usually involves copious amounts of caffeine, alcohol, or mind altering drugs or some combination of the three. My body can only take so much abuse. I know what you mean about your body being abused. Mine’s been through the wringer – I’m surprised I can still do what I do. As far as “WTH” feeling when going through old projects – I have had that before, even to the point of vocally criticizing code (and the programmer) to my colleagues, only to stumble across _my_ initials in the code. Oy! I am currently reworking one of my first projects that I worked on after my strokes, a remote-controlled AC outlet. Besides being really ugly – my soldering skills weren’t quite back to snuff yet – it wasn’t put together well. I plan to use it for my Christmas lights on the office patio, just point the remote through the window and turn the lights on and off. BTW: Thanks everyone for the comments, and thanks to Hack-A-Day for posting my project! 3.2.1 Each of the GPIO pins, except GP3, has a individually configurable weak internal pull-up. So the 10k pull-up I included in the design is required. I tried it without the 10K pull-up, with the /GPPU bit in the CONFIG register set to both ‘1’ and ‘0’, and – it doesn’t work. Either it sees the button as always pressed, or there are spurious glitches on the line. And the ‘roll dice’ button doesn’t work. As to the charlie-plexing – I could put RA2 on the anodes of one set of LEDs and the cathodes of the other set and then use that to select the die face. I’ll try that out on my next board. I’m making Christmas presents – heh – so there will be quite a few made. Most of the resistors are on this board because I have to connect the PICKIT2 dongle to it for in-situ programming. When I get to the ‘production’ versions – IE: the ones I will use for gifts – the PICs will be pre-programmed and I won’t need the ISP header, socket and most of the resistors. If the charlie-plexing works, that will _really_ reduce the part count. These are the kind of hacks I love. Few pins, minimal parts, yet lots of I/O. …and in before the ‘back in my day we had to use 4017’s & 555’s, and we liked it’ crowd. Repost for starters also this is a ridiculously old in terms of hacks. 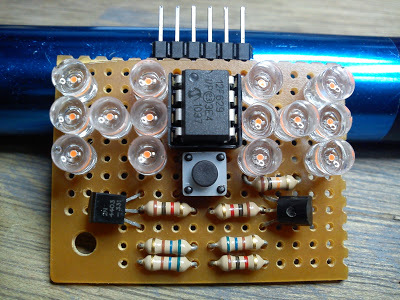 By that I mean using an 8 pin microchip PICs to control 14 LEDs to create 2 dice. I used the PIC 12F629 because it was what I had, other than a PIC 12F1840 which really would have been overkill. I like the 12F629 as it is versatile for a lot of different projects. Plus a little faster (8mhz), which allows me to do bit-banging I2C at around 80Khz. I haven’t seen the other die projects out there – I previously did a single die version, which display two die values on one die by ‘flashing’ between the values. I guess the evolution of projects that use an I/O limited micro seem to follow similar paths. I used to be a hw/sw engineer for various startups and larger companies – but have since been sidelined by 4 brain stem strokes. I can’t do fine soldering anymore, so I stick with through-hole components and DIP ICs instead of surface mount. I mostly just do these type of projects to keep my skills honed and not go stir-crazy in my forced retirement. The most important thing to me is I have fun doing these projects – some small (like this) and some big. Can’t work anymore, so I might as well hack! Good on you! There’s little new in this world, and this is genuine, ingenious hack – a quality piece amongst the flotsam of mediocracy. More please, TS! Who cares whether it’s old or new. You made something cool and got it published on HAD. +1 from this old dog. Next Project: Dodecahedron capable Bag-O-Dice in one. Send me the specs and I’ll see what I can do! I’ve posted the code, if anyone is interested. Maybe – but I can add a shake sensor using a weighted spring and a contact post. Nice idea! For you mikroC fans out there..
It’s for 12f683 (the only available Friday night). Tnx Timothy, you saved my weekend.